Hey Everyone – it’s Tom here today and I’m very excited to be sharing a quick update on the Jurassic World Fallen Kingdom Franklin figure from our friends at Mattel. First debuted at San Diego Comic Con back in July of 2018, there has been rampant speculation about when, and even if, Franklin’s character would ever actually see the light of day. Franklin was an arguably important character within Fallen Kingdom – going hand in hand with Zia, who we already have. It felt important that we receive this figure – as I don’t think the set would have quite felt complete without him. 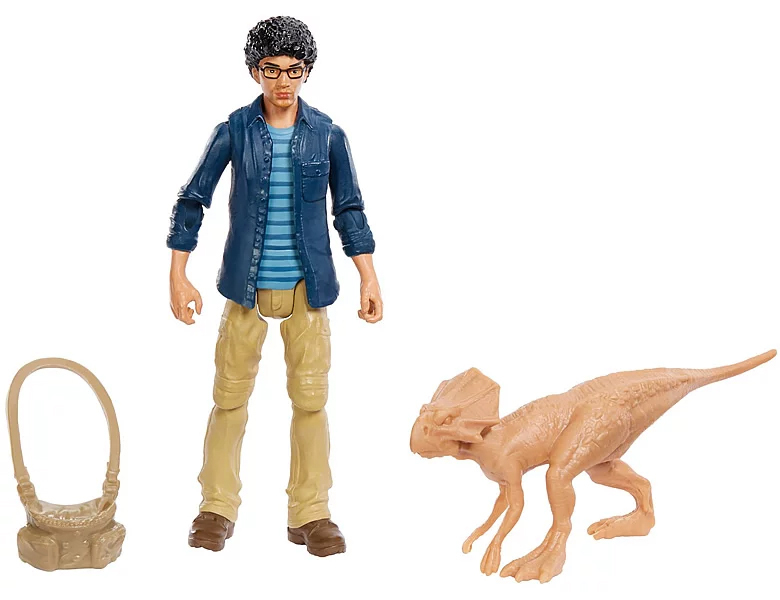 Now, in April of 2019, we finally have our first look at Franklin – who is rumoured to be the ONLY new human figure to release in 2019, alongside an assortment of different repackages from 2018’s offerings, following a similar vein to the first quarter Dino Rivals human releases. 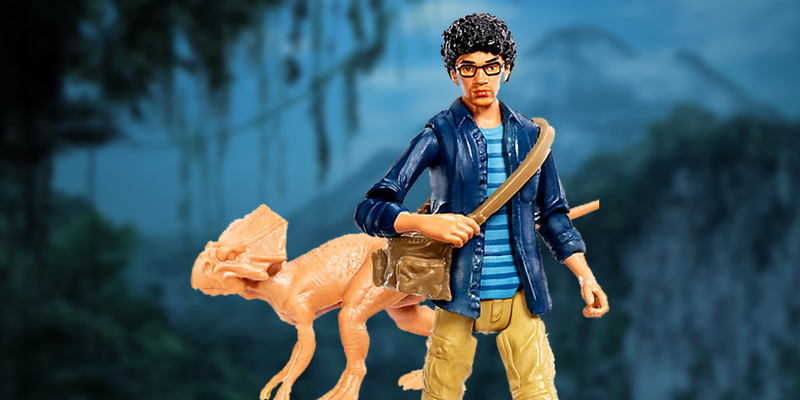 Franklin looks great – with his iconic outfit represented well within the Mattel figure scale, capturing everything from his tan cargo pants to his ruffled, curly hair and glasses. 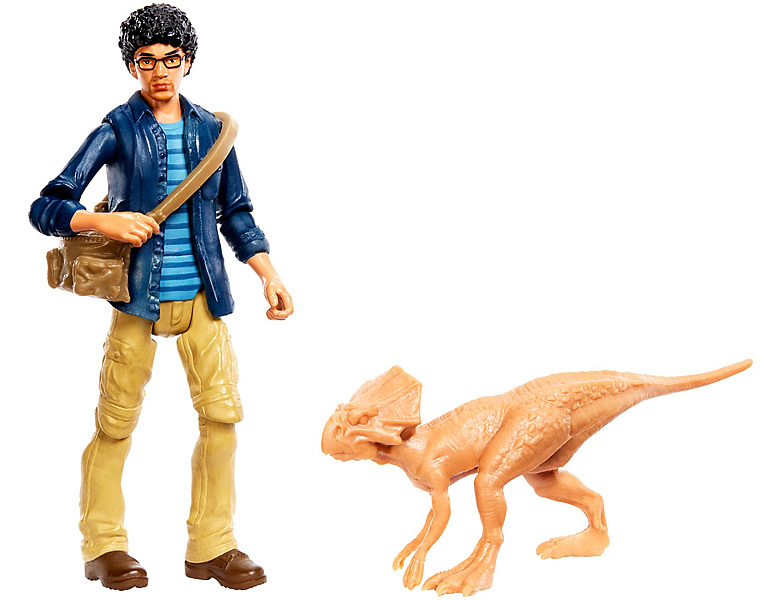 This looks like a great rendition of Justice Smith for the scale it is offered at. Franklin also comes with the Microceratus – an exciting decision as up until now, this smaller dinosaur has only ever appeared in some of the cancelled Destruct-A-Saurs sets. This has made this character incredibly illusive amongst the collecting community – so I think the inclusion of this micro character in a mainstream format was a smart decision on Mattel’s behalf, and one which has me excited. 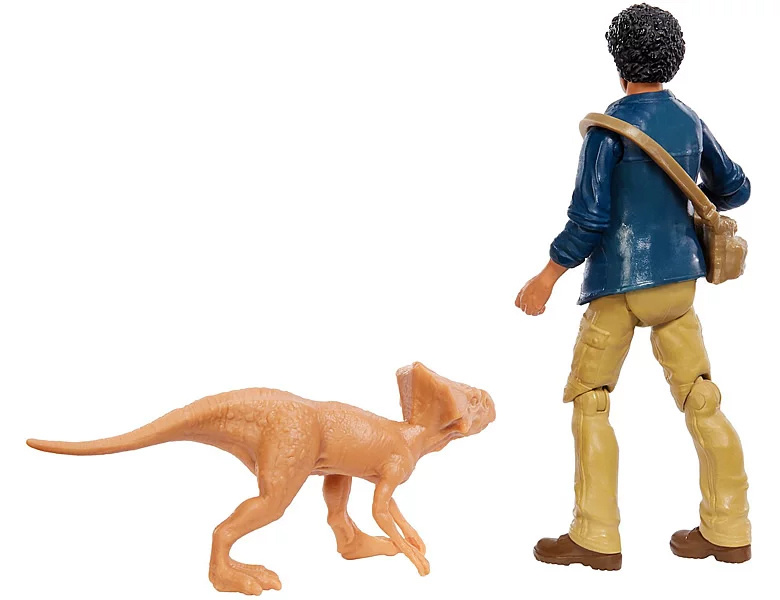 Franklin’s other accessory here is a satchel like we see within Fallen Kingdom, however it looks like Mattel have cut a corner here as on this figure we do see a simple re-use of Owen’s food bag from the Owen Grady and Baby Blue figure which debuted in the first wave of human characters back in 2018. This is incredibly unfortunate as whilst the piece works, to a degree, the original prototype version we saw had a brand new rectangular satchel with some incredibly nice sculpted details on it which would have been a useful piece to add to the line. Still, as with much of the Dino Rivals assortment, costs have had to be cut in a non-film year, so I am grateful Mattel still found a way to squeeze Franklin out. What do you all think of this figure, and will he be joining your collections? Furthermore – if you could introduce just one more wave of human characters, who would you choose and why? As always, sound off in the comments below, as we really appreciate your support! Franklin’s gone from “probably pick up eventually” to a definite get thanks to the Microceratus. He was originally listed as coming with a Triceratops and they’ve released the mini Triceratops a half-dozen times so that was a bad choice. This was a much better pick for a companion dinosaur. The line’s most obvious omission is Eli Mills. A Gunnar Eversol with a little auction pulpit to stand behind and a gavel to bang would have been fun, too. The only named human villain we got at all was Wheatley, forcing people to use generic mercs to fill out the ranks of that all-important role, the dinosaur victim. I agree 100% mate – really glad they switched out the Trike in the end. I also agree about Eli – a few different looks for him to choose from. I think Doctor Wu not getting a release was also extremely unfortunate. 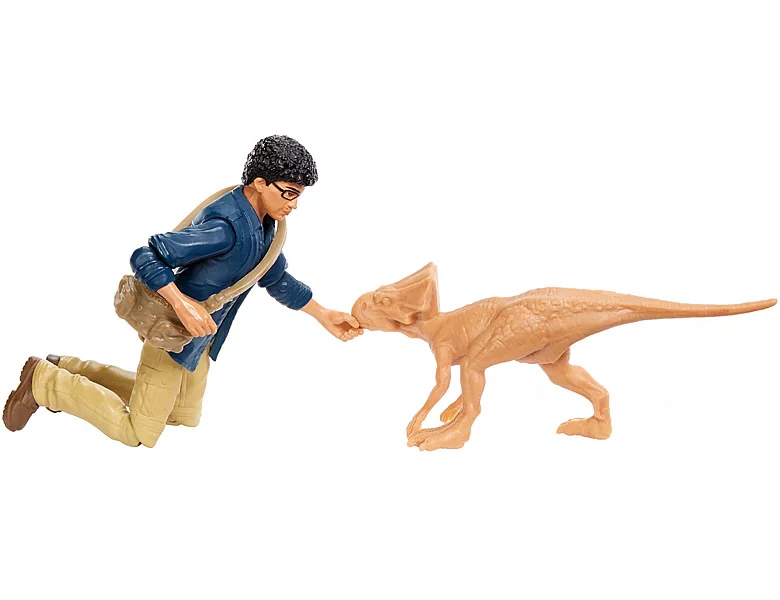 I feel like Mattel has already made far too many Dinos up front and not nearly enough on the human side of things. While we’ve been absolutely and unbelievably spoiled with “Dino diversity” it’s come at the expense of getting great human characters. I think this plan could bite Mattel because too many repainted Dinos will wear out collectors and so will constantly repacked humans. We most certainly deserve more from the original movie and sequels as well. 4 is so lacking and they already screwed up Grant’s rerelease by not using plaid deco – yet humongous dinosaurs get sometimes 4 different colors of detail on a much greater scale. Not happy about the lack of humans. More human figures, vehicles, playlets are definitely at the top of our list too! Agreed 100% with Tim – more Humans are a must! It’s a shame retailers aren’t willing to carry more humans – but maybe this could change in the future with the line absolutely dominating at the Toy Awards and proving it’s worth! 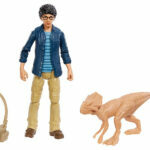 Good to see a new human figure, which are badly needed for the Jurassic line instead of just another Owen re-pack. What about the Security Guards from the first Jurrasic World? Would be nice to get some soldiers represented from them, and the Indian dude who was in charge of the Island. They’d be good, too. Be nice to get a variety of soldiers and ACU personnel. I would love some more ACU personnel. One had a net-launcher in the film too, so lends itself well to a fun accessory. Agreed wholeheartedly Erik. New characters are ALWAYS a plus. There are so many other interesting characters from previous movies to be made yet they chose this nobody. amazing. Hahaha – new figure is better than not still! Perfecct, I going for it. Glad to hear it dude – share photos with us later this year when you pick it up!